/ Modified nov 14, 2018 3:49 p.m. In the days since Doug Ducey was elected for a second term as Arizona’s governor, government leaders in neighboring Sonora, Mexico have offered their support and congratulations. Sonoran Gov. Claudia Pavlovich praised Ducey on Twitter saying she’s confident he will continue working not only on behalf of Arizona families but to strengthen the so-called Arizona-Sonora Megaregion. Cada logro se gana a pulso. Muchas felicidades, amigo gobernador @dougducey por tu reelección. Sé que seguirás trabajando con entusiasmo y empeño a favor de las familias de Arizona y consolidando la #Megarregión construida con Sonora. ¡Un fuerte abrazo! The state’s economy secretary also made a statement calling the re-election good news for Sonora. He said Ducey’s government has worked well with Sonoran officials and his continued leadership will provide stability that benefits both states. 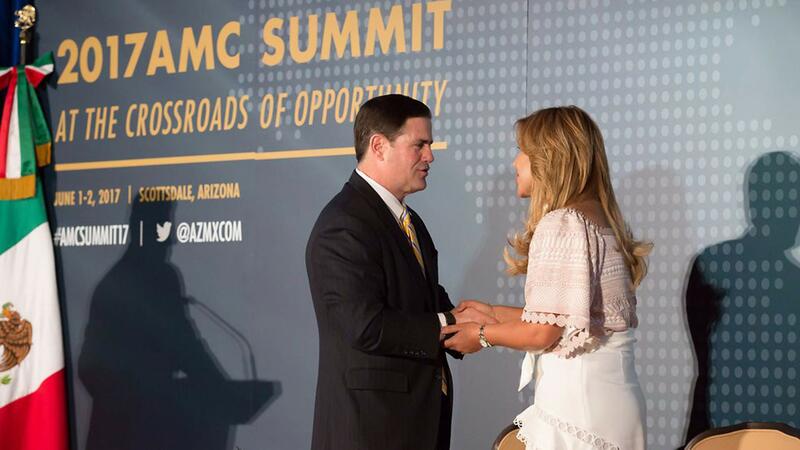 Ducey touted Arizona’s improved relationships with its southern neighbor in his re-election campaign and has emphasized the importance of binational business and trade for Arizona’s economy. Some of Ducey’s policies on border security — including his support for President Donald Trump’s recent deployment of troops to the border — are less popular with Sonorans.